Have you ever imagined that an entire theatre could be hiding behind the cover of a little notebook? I certainly hadn’t, until one day, after carrying my grandfather’s story of his exile for years, I opened a small sketchbook and began to cut out shapes and forms. When I finished the book, which was meant to be sent to the Sketchbook Project in New York, some very dear friends convinced me to publish it. With their help, collaboration and support, we set up a crowd-funding campaign to publish as small edition of the book. Although at a first view, it may seem to be a decorative paper-theatre, there is a whole history behind To Night and Back · Mece la noche, a history that I am unable to grasp completely. In 1947, during the war that lead to the Partition of what we now know to be India and Pakistan, a large part of the Hindu community from the region of Sind – including my family – was forced into exile. This turned us into a wandering tribe, a diaspora spread across the world. I was born in Morocco, but have roots in India, Ghana, England and now in Spain. This has allowed me to live in and learn about very different cultural traditions. The few things I know about Sind come from the way our family has tried to preserve it’s traditions and values, from the stories told to me by the elders of the community and more recently through books. The stories told to me by my grandparents and elders of the community were very often brief. It seemed to me while growing up, and still now, that it must be very painful for them to remember what they had to leave behind, but at the same time they cling on to whatever they can in daily details such as cooking typical dishes, insisting on speaking Sindhi, celebrating Sindhi festivals. 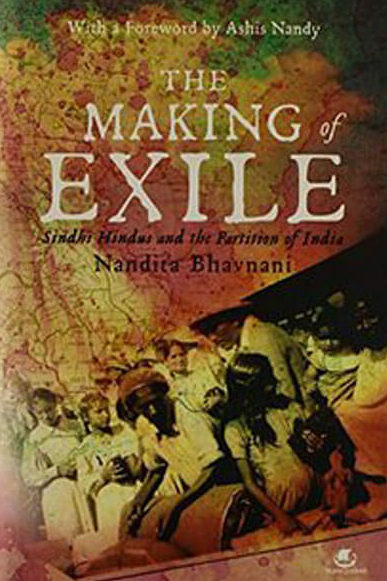 Over the past 5 years, on various trips to India, I have discovered wonderful publications such as Nandita Bhavnani’s The Making of Exile: Sindhi Hindus and the Partition of India, Saaz Aggarwal’s Sindh – Stories from a Vanished Homeland and Sindh: Past Glory, Present Nostalgia. 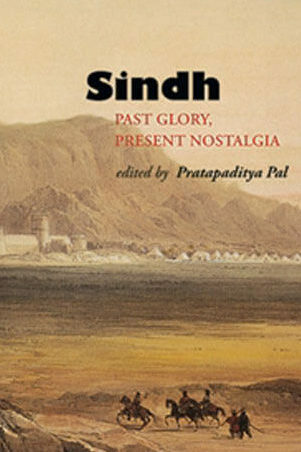 Though each book has a very distinct voice and style, each address the vital issue that until now it has been very difficult for Sindhi hindus to look back onto their exile and share their story. Book trailer for Sindh – Stories from a Vanished Honeland which visually explains an overview of the history of Sind and the exile of the Hindu Sindhis. Part of my bibliography while researching about my past Sindhi history. From top left (clockwise): Sindh: Stories of a Vanished Homeland by Saaz Aggarwal, The Making of an Exile by Nandita Bhavnani, Sindh: Past Glory, Present Nostalgia edited by Pratapaditya Pal and Marg magazine volume 60 dedicated to Sindhi arts. I am grateful to all of these (and many other) sources who through the years have helped me put together bits and pieces of the puzzle and learn more about this “imaginary homeland”, as Salman Rushdie would say. In his essay of the same title (which can be read in it’s entirety by clicking the link), he explains the notion of reconstructing imaginary identities after exile, what is lost, what is gained and how writing and memory permits humanity to reclaim its sense of loss. 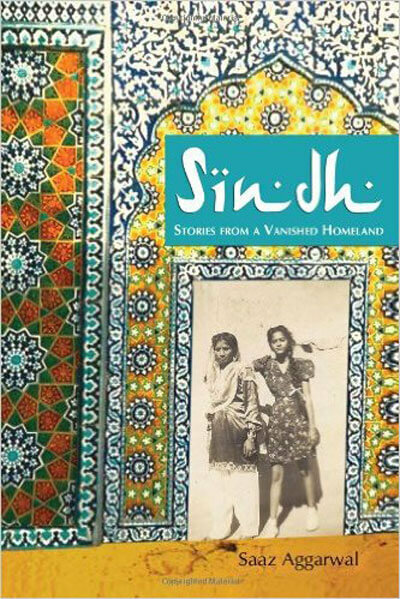 “It may be argued that the past is a country from which we have all emigrated, that its loss is part of our common humanity.” This project was born from this very wish to understand a bit better just what being a Sindhi means to me. It was a voyage and homage to the imagined land of my elders, to which I have not yet travelled physically if only through the stories they told me through my childhood. 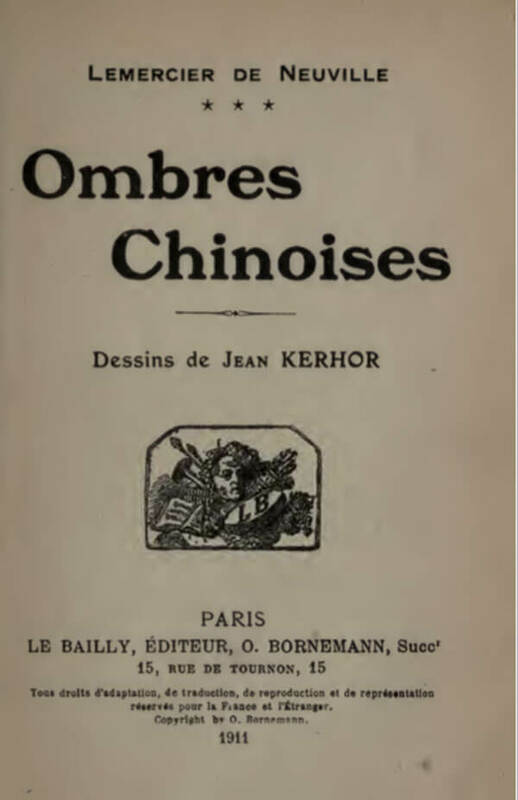 The book is also the result of extensive research into the different narrative techniques – whether they be traditional, modern, occidental or oriental -, from all of these cultures that I have been lucky to be exposed to. 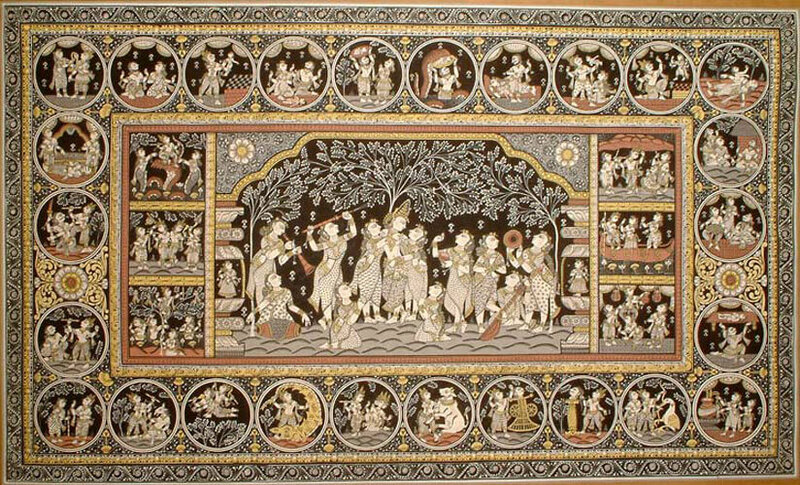 These include formats such as: kalamkari, miniature painting, cut-outs and paper-theatres. Without really planning it, many different techniques I had been exposed to both as a child and as an adult seemed to find their ways into the book. 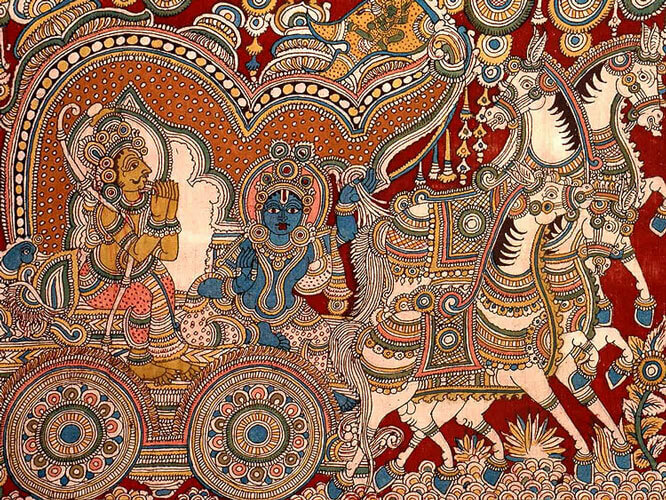 For years prior to making the book, I had been fascinated with kalamkari, a hand-painted or block-printed cotton textile, produced in parts of India. 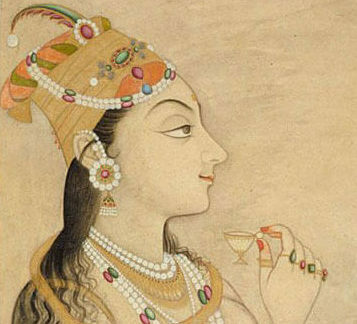 Traditionally, this technique was used by storytellers, musicians and painters, called chitrakattis, who moved from village to village to tell the dwellers the great epic stories of Hindu mythology. 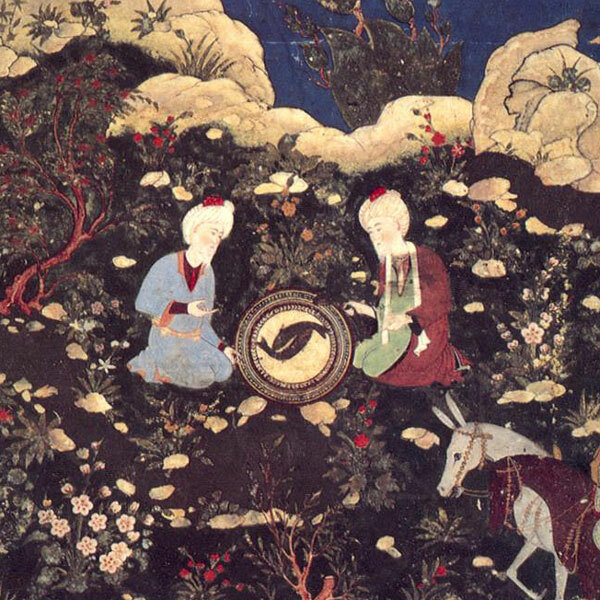 They would illustrate while telling the stories on the spot, on large canvases using rudimentary natural materials available such as dyes extracted from plants. 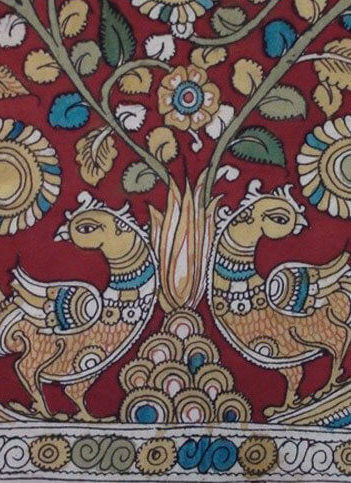 The word kalamkari comes from the Persian words ghalam (pen) and kari (craftsmanship) and literally means drawing with a pen. I studied occidental textile and printing techniques at college in London, and though different, they also use the black line on paper. 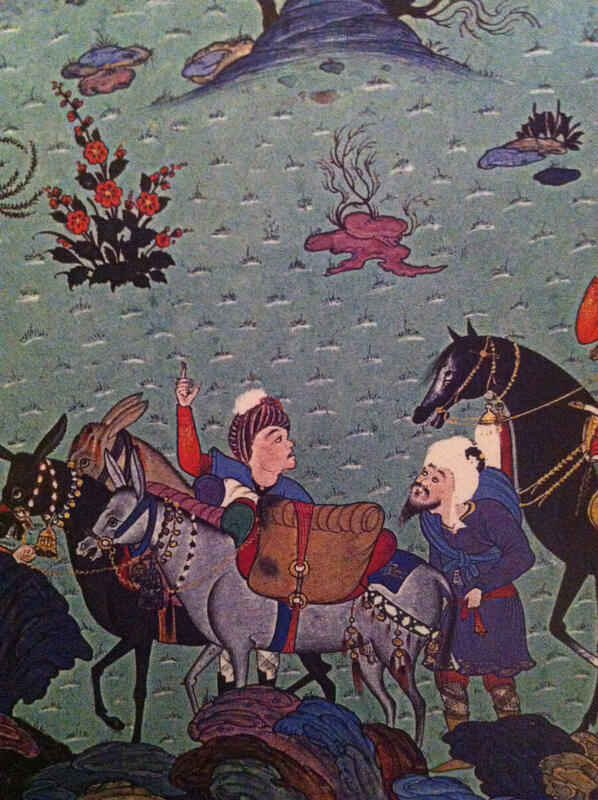 The drawing style used in the book is a result of this mix between occidental printing and the decorative patterns that Kalamkars use to create images. 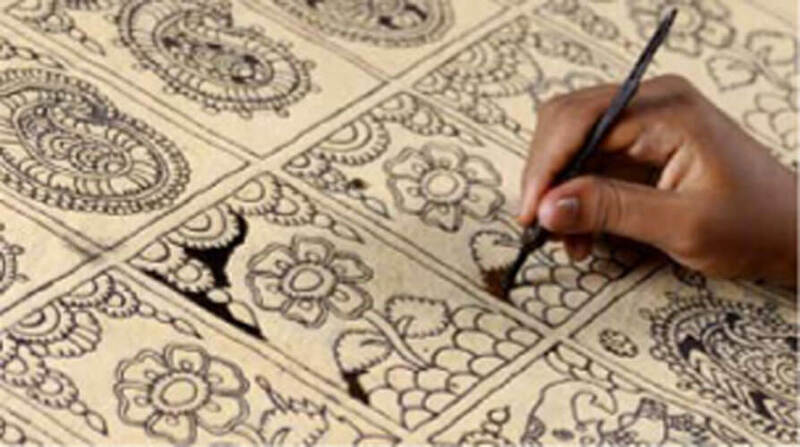 Image of a craftsman hand-painting the black decorative line. 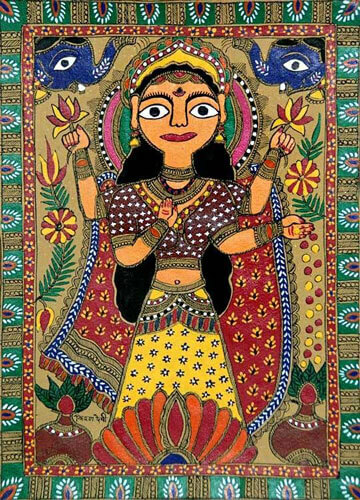 On the left: an image of goddess Durga Ma – the mother goddess. 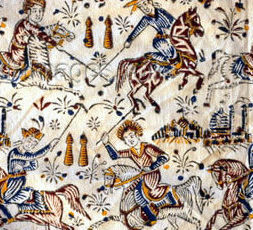 On the right: a decorative peacock fabric. 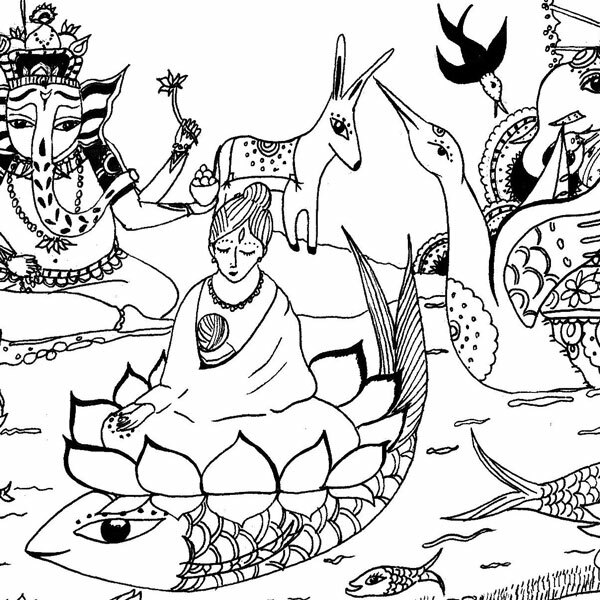 Three festive scenes of Lord Krishna – the god of love, the last of which shows him and all his adoring milk-maids on a swan boat. 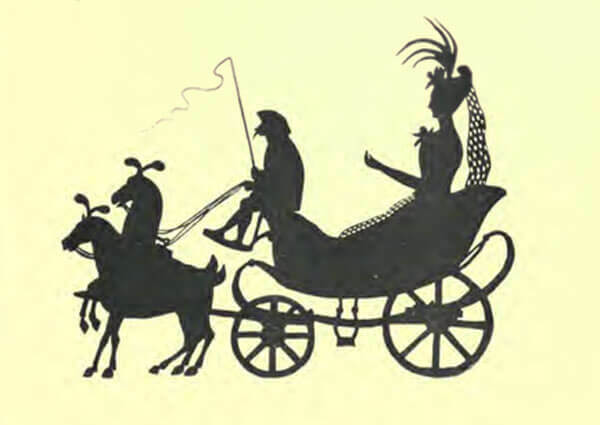 This swan boat, which is meant to symbolize the voyage through hardships towards love, is the very same seen on one of the final pages of To Night and Back · Mece la noche. 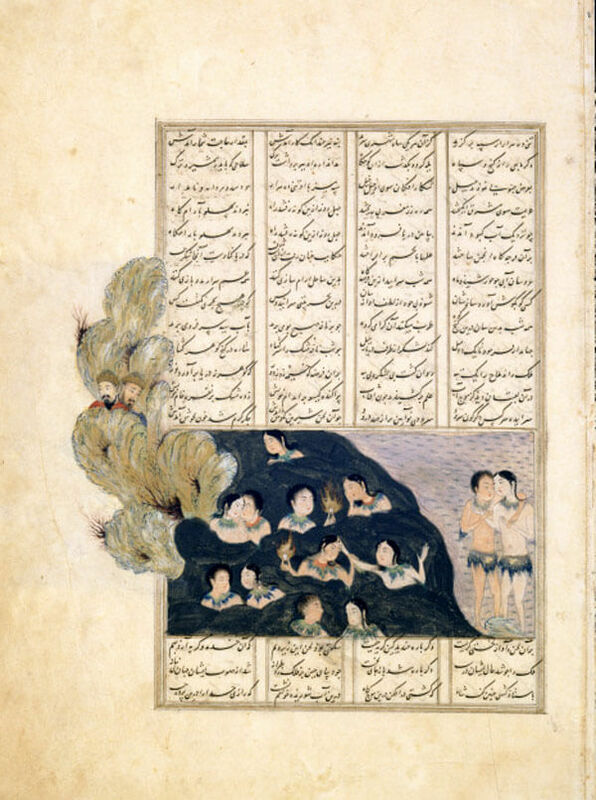 Another source of inspiration for the book, and for most of my work has been miniature paintings; from the ancient Persian tradition and from the Mogul period in India (between 1526 and 1648). 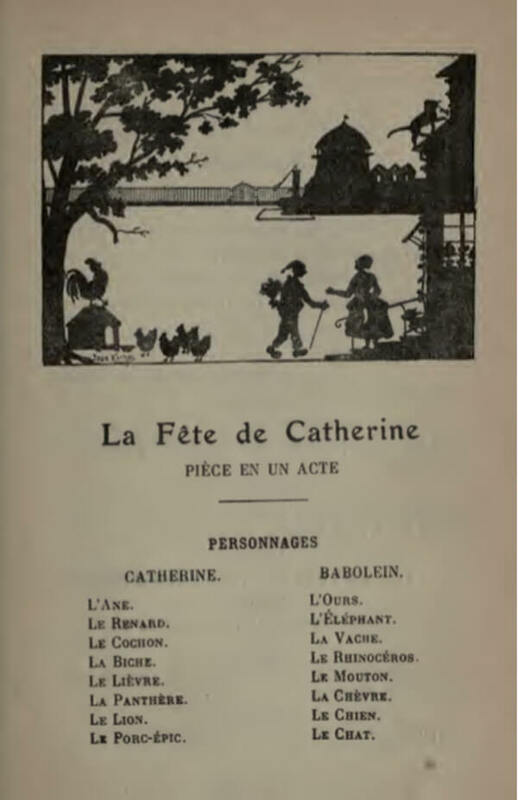 Both visual languages share elements such as the careful composition of text and image on the page and lack of perspective. 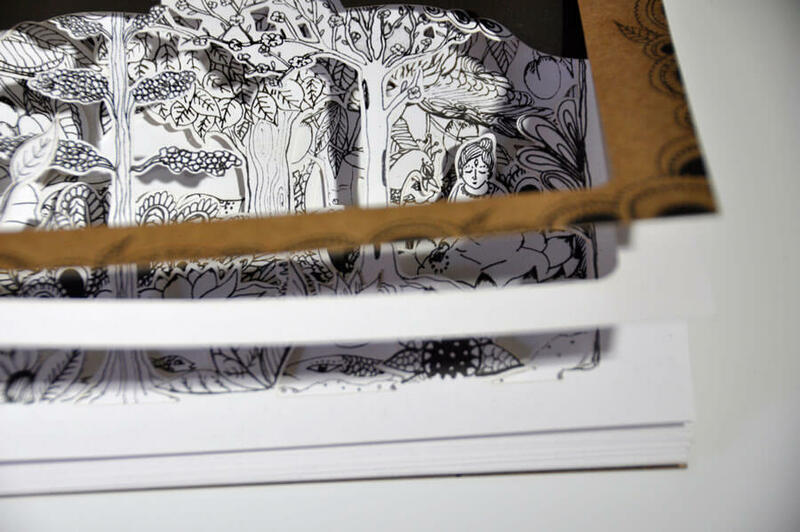 My entire book draws inspiration from the lack of perspective and plays with the superposition of cut-out layers of paper to create a sense of depth. 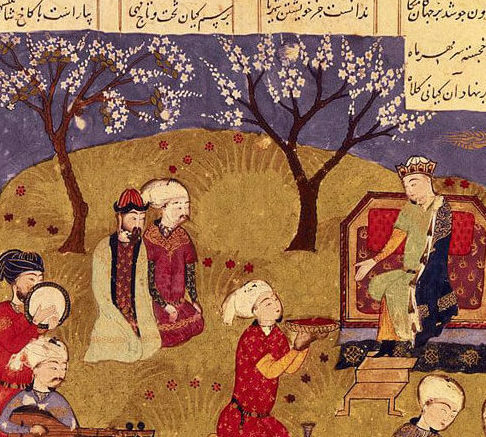 At the end of the book there is a surprise poster that was designed using elements from miniature painting illuminated manuscripts. A small selection of miniature paintings. 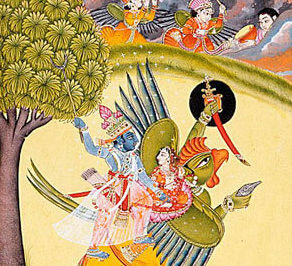 On the top row from left the right: Indian painting of the bird god Garuda carrying Ram and Sita on his back. 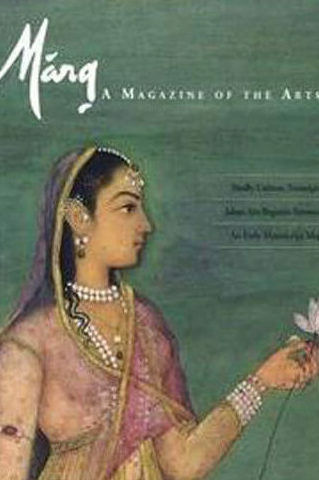 Indian princess from the Mogul period. 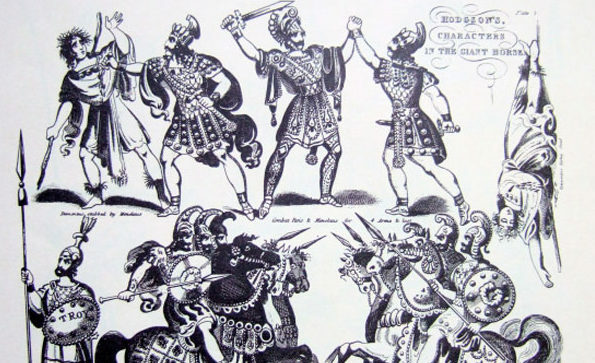 Persian warriors. 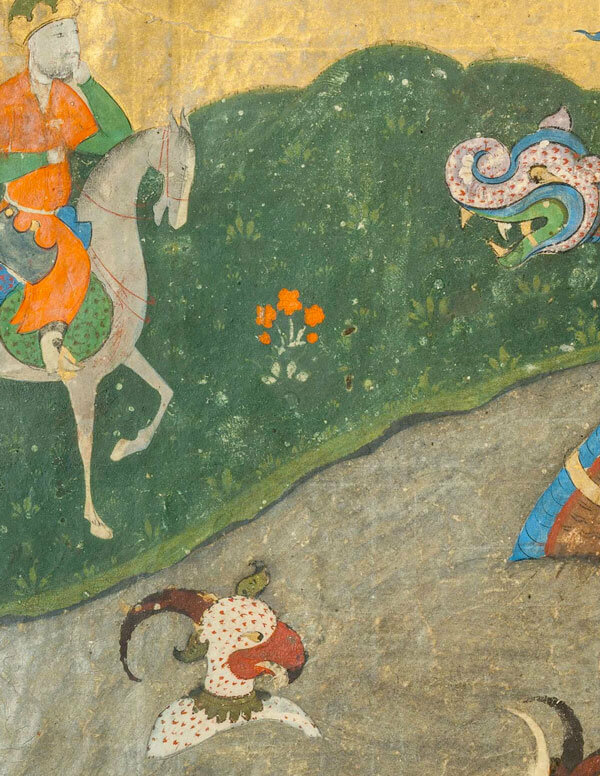 The bottom row consists of three Persian illuminated manuscripts. 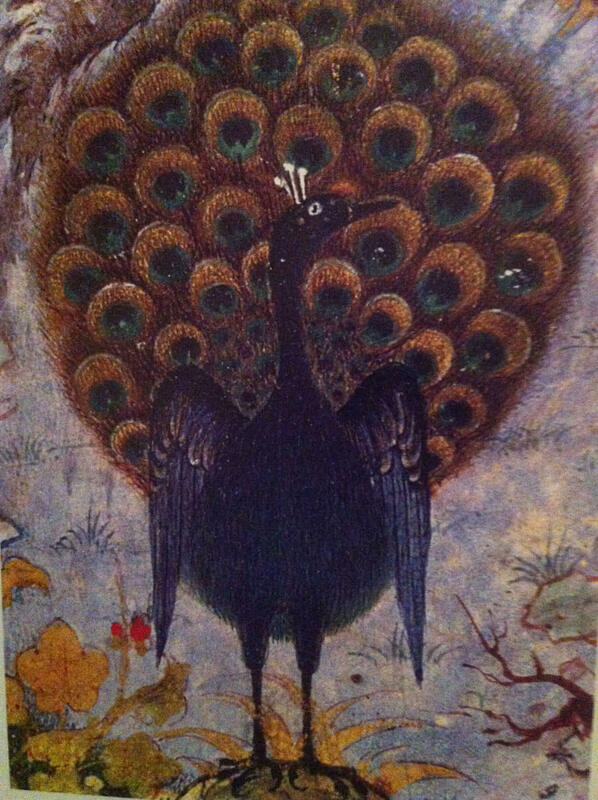 A selection of Oriental Islamic miniature paintings from Diane de Sellier’s edition of Le Cantique des Oiseaux by Farid pd-din ‘Attâr. When talking to me about Sindh, my grandfather always mentioned that before partition, the region was rich with a mix of Hindus, Muslims, Sikhs, Persian and Sufi cultures and traditions. This is still reflected in the language, food as well as in rituals and music. 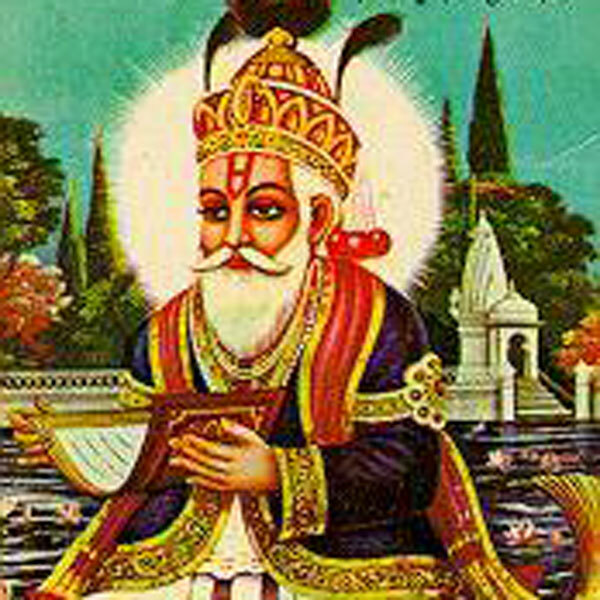 In our family home, like in the home of most Sindhi families I know, there is an image of the Sufi Saint Jhulelal. 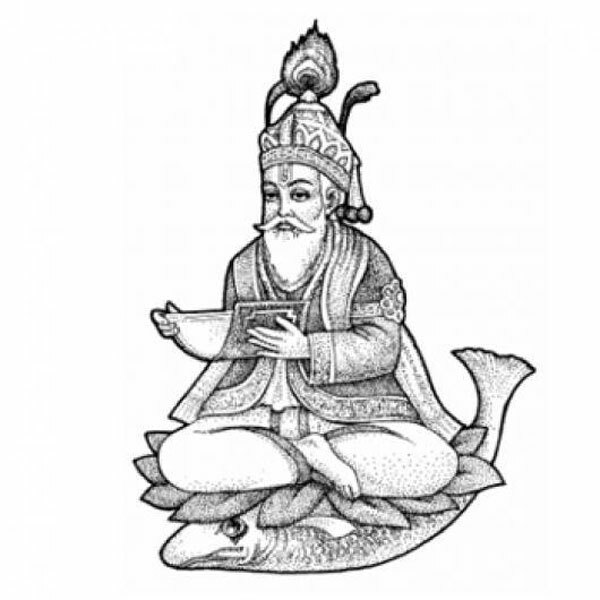 On Cheti Chand (Sindhi new year) a special offering is made to him with festive songs, lamps and flowers.This saint exists in many interwoven legends which bring together the Hindu and Islamic traditions of the region in popular folklore. 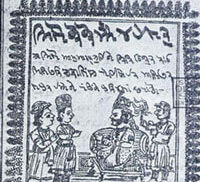 One one hand the name refers to the community God of Sindhi people and an incarnation of Hindu God Varuna. 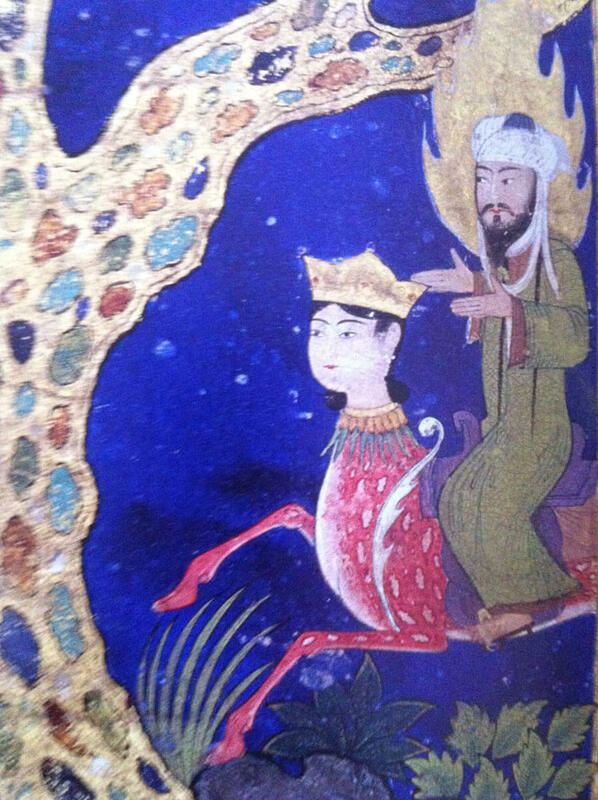 On the other, the name also refers to Al-Khidr. 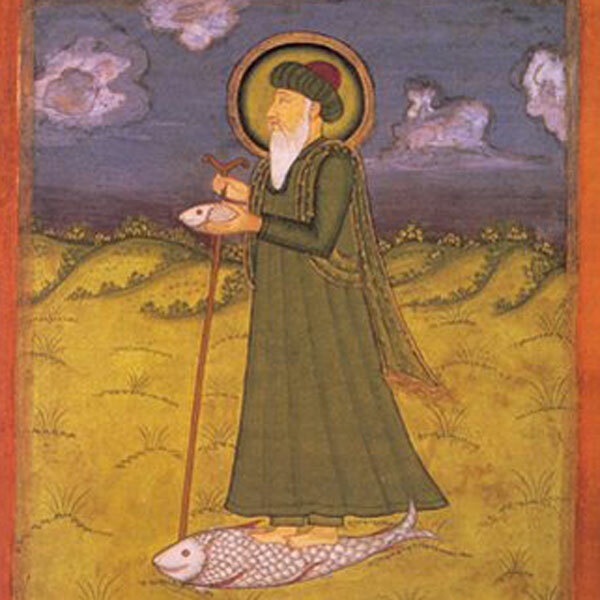 In both case, the saint rides on a large Illish fish, called a Palla in Sindhi. 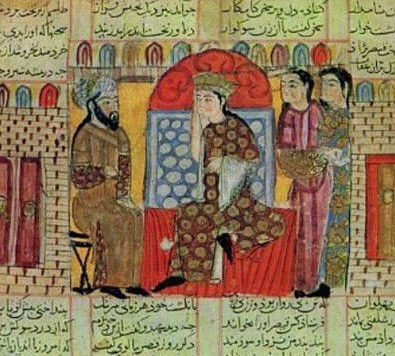 He is said to ¨rescue and protect people in times of danger, saving the pure in heart from theft, drowning, snakes, and scorpions.¨ From an article by H. Talat Halman. 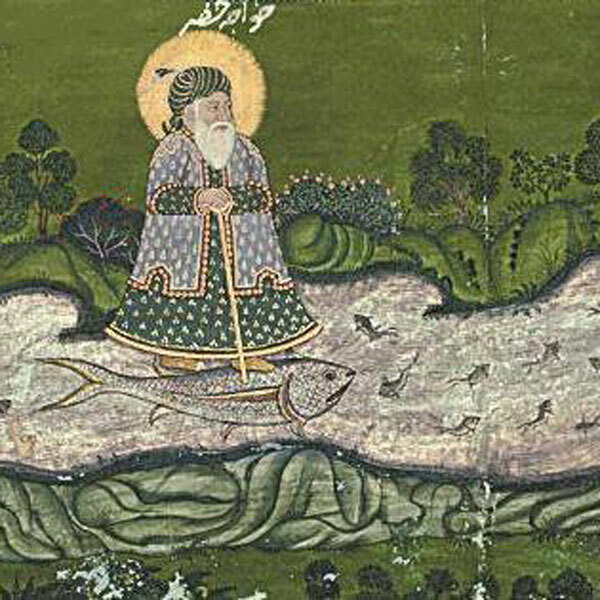 In To Night and Back · Mece la noche, to make a reference to Jhulelal, grandmother Ama rides on a Palla fish upon a lotus flower. She carries with her all that she can from her homeland. 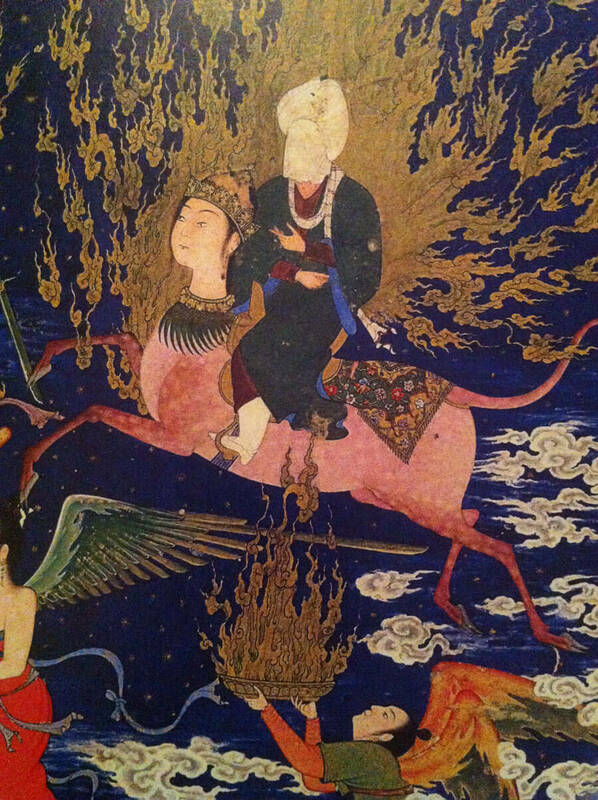 From top to bottom: images of Jhulelal, Khidr and Ama.The final two images were photographed by my dear friend, Kenza Benamour, whose vision and knowledge of Sufi spiritually has helped me understand a lot about Sindhi culture through the years. To enter the universe of my elders, I allowed myself to play with the use of paper and the traditional book format. 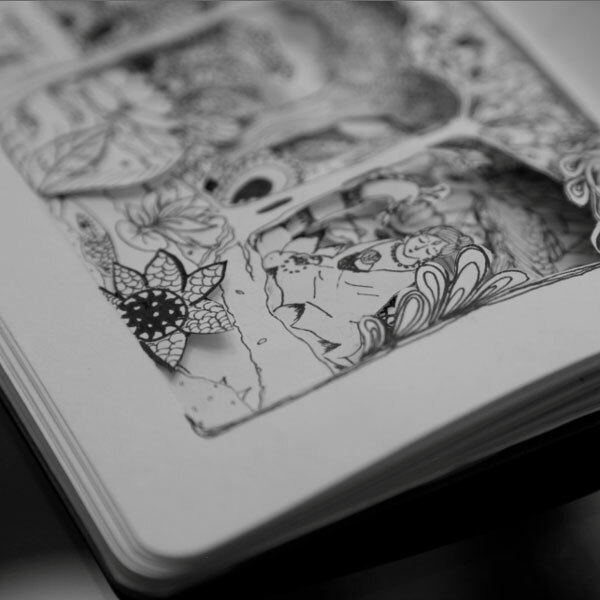 Inside a simple notebook I created a theatrical landscape that changes as you turn the pages.Although there are no shadow puppets in the book, the superposition of the pages create shadows and interesting contrasts. 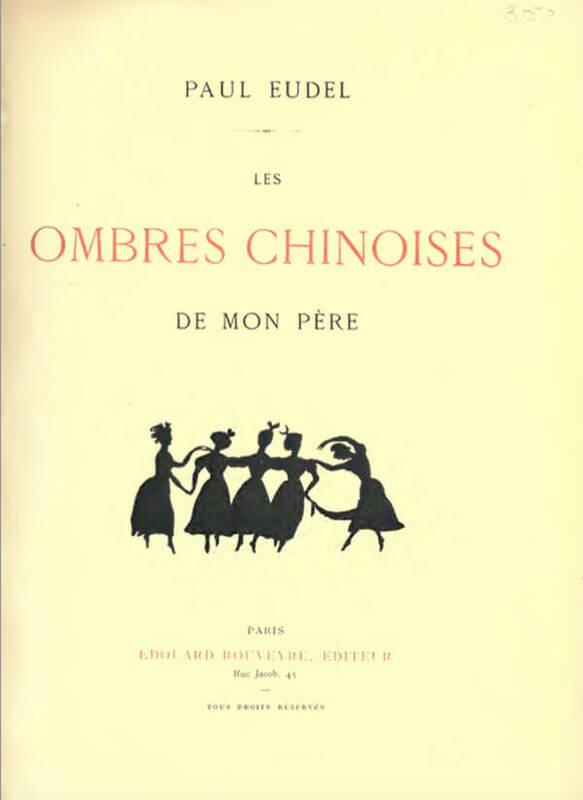 Before making the book, I had been researching all kinds of traditional and ancient forms of paper cutting to tell stories.There are wonderful sources online such as this book about Chinese shadows that can be found at the BNF. 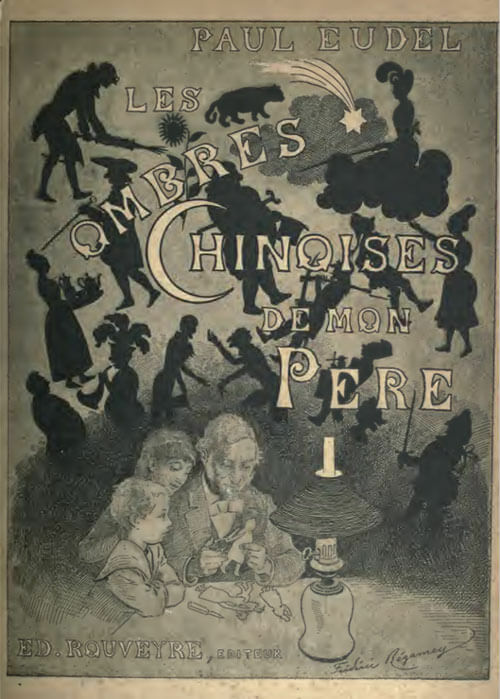 Les ombres chinoises de mon père by Paul Eudel 1837-1911. 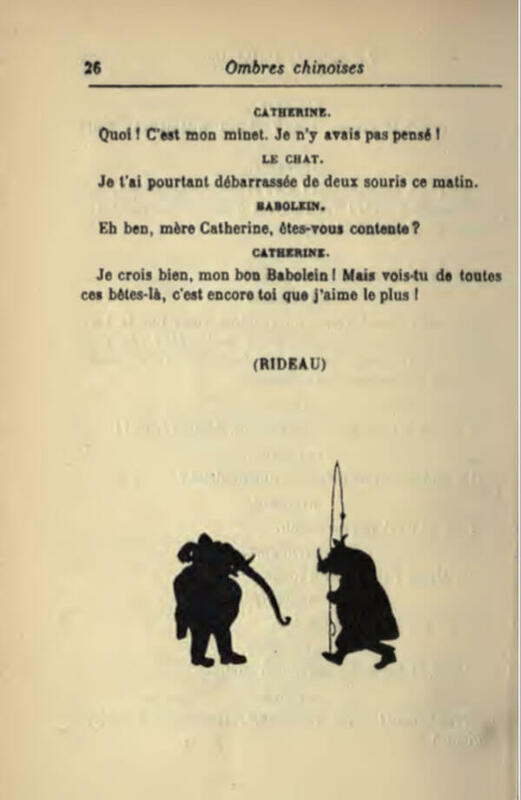 The blog Theatre d’ombres et de Silhouette also compiles a rich source of templates, vintage puppets, artist references, theatre scripts and stories to download. 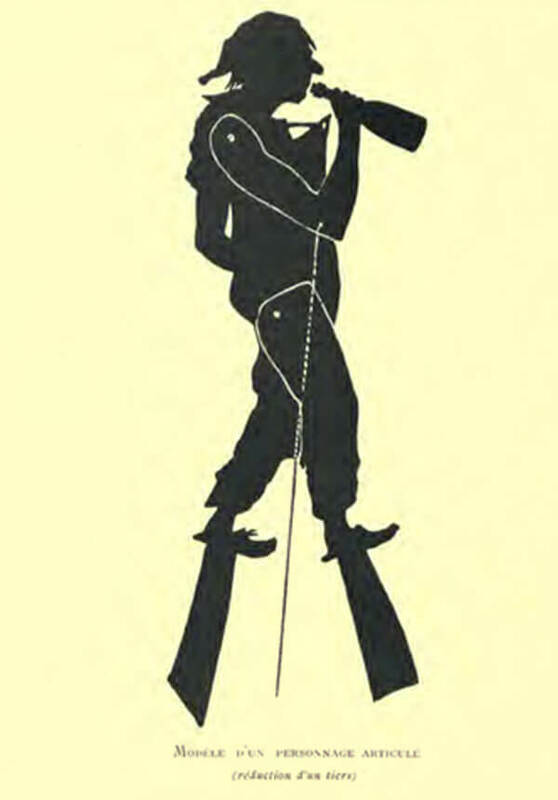 Antique books about shadow puppets. I attended a course about shadow puppets taught by Alexandra Eseverri from Asombras at the Casa Asia in Madrid. 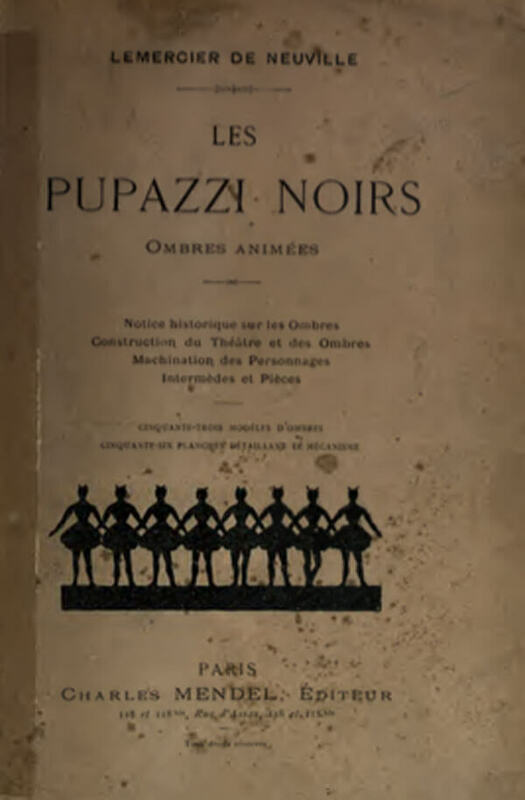 Though the course was brief, it introduced me the the history of shadow puppets and their different manifestations throughout Asia and Europe. 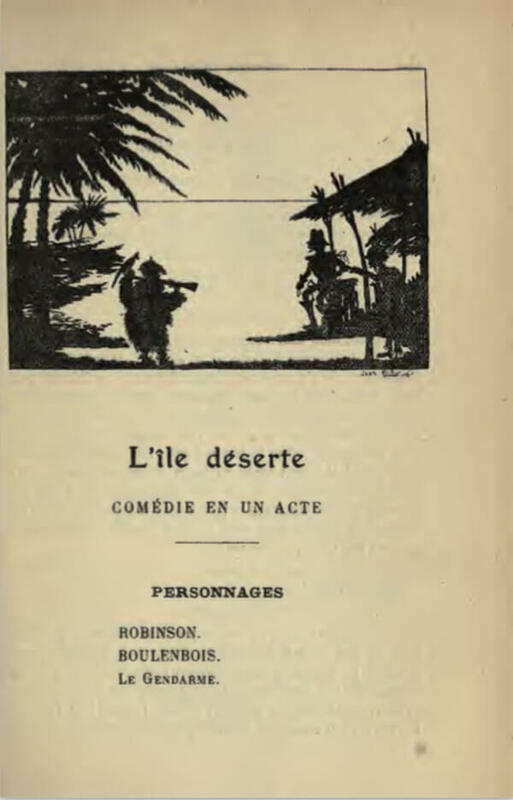 I also discovered the silhouette animation movies of Lotte Reineger. After the course, I watched every one of her films and was very much influenced by her magical way of using a pair of scissors and black paper to create forms with so much life in them. 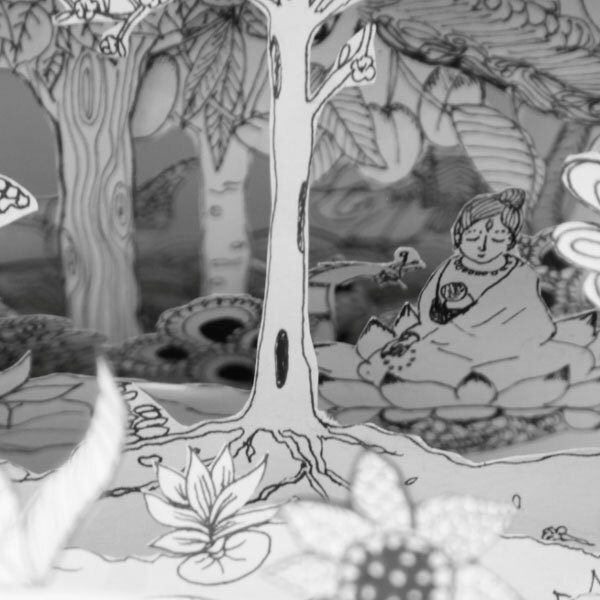 Without really noticing, around that time, paper cutting became something of an obsession. I applied it to my illustrations as well as to the workshops I was giving. Through my work on this project, I took particular interest to paper theatres. I used the campaign launch as an excuse to indulge into this interest and create three dimensional boxes using characters and settings from the book. The boxes were made by the cardboard artist Rachid L’Moudenne. At the launch party of the campaign of To Night and Back · Mece la noche, I exhibited 5 paper theatres inspired in the universe of the book. Paper theatres are magic. With a pair of scissors and instructions, you can transform a few printed sheets of paper into a space where stories can be narrated. 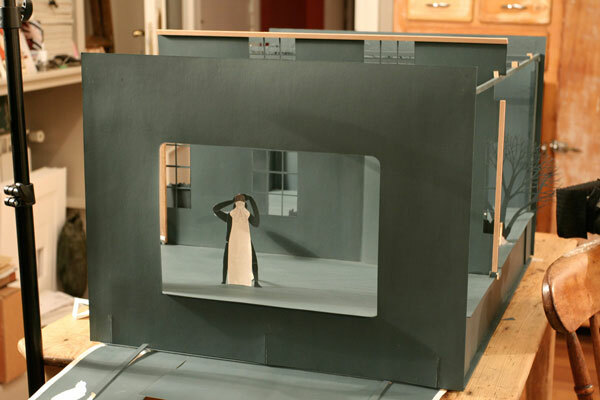 Over the past years, I have become increasingly fascinated with paper theatres and other formats for storytelling such as the Kamishibai. 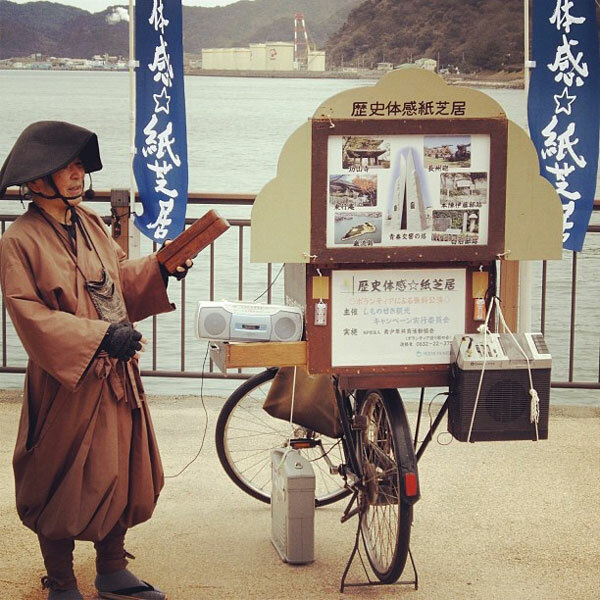 A traditional Japanese Kamishibai, fully equipped with wheels and a sound system for efficient storytelling purposes. 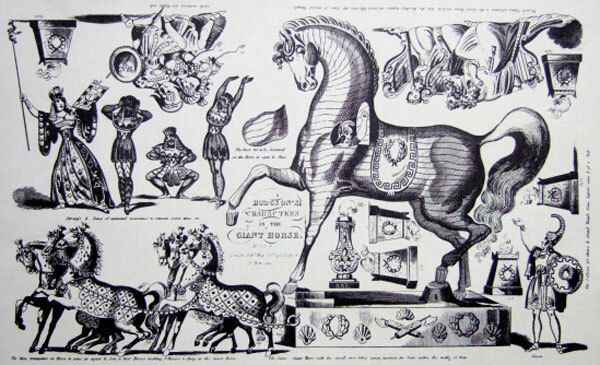 I also researched lots of paper theatre formats. Although I haven’t visited it physically in over a decade, I made lots of virtual visits to Pollock toy museum. 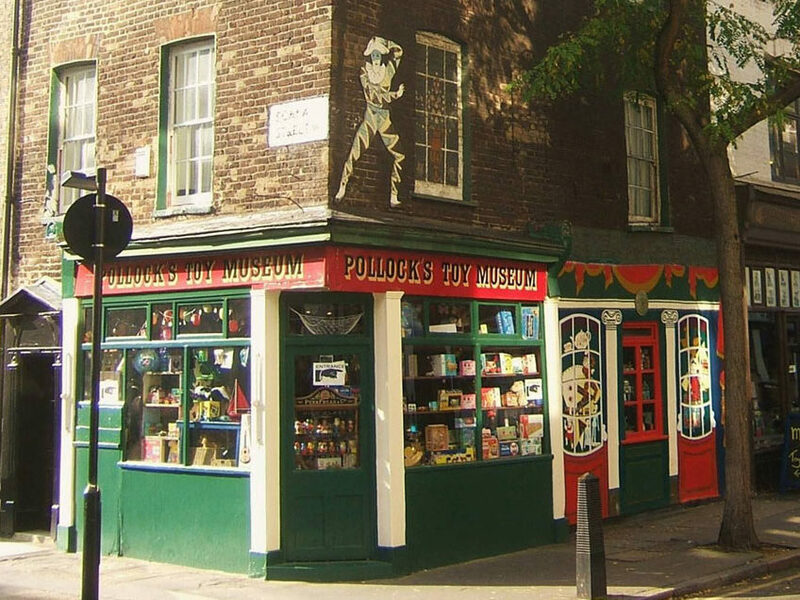 Pollock’s was originally a shop and printers, dating back to the 1850’s. 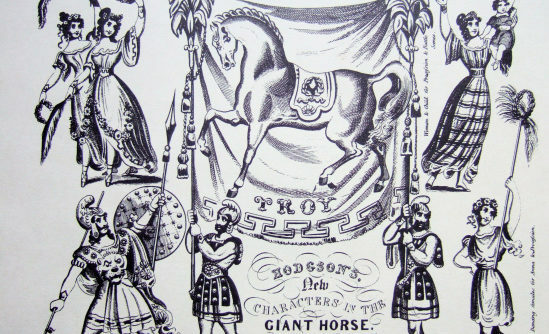 Benjamin Pollock hand printed, constructed and coloured much of the toy theatre material housed in the museum today. Another source of material was Lucia Contreras Flores’ fantastic book and website Teatritos. After much research, I attended Lo mío es puro teatro, a course by Gustavo Puerta Leisse and Elena Odriozola. 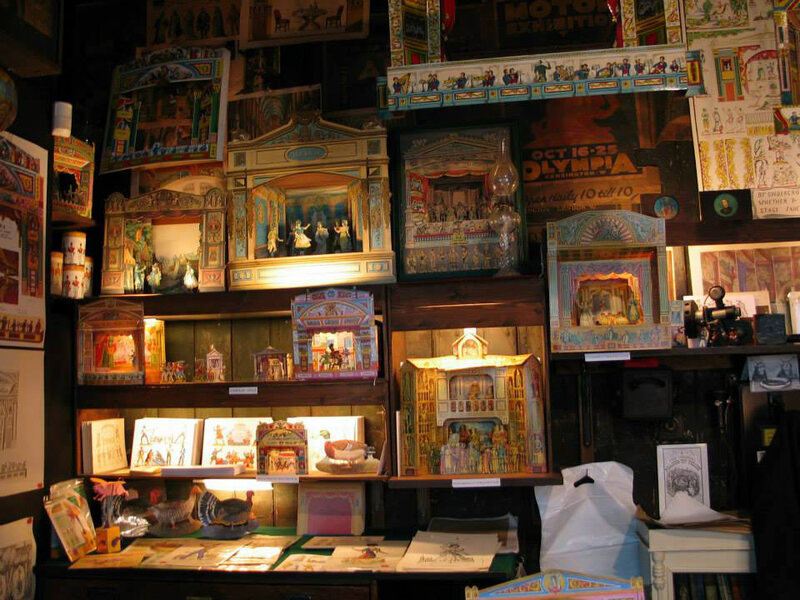 There I began to understand how to play with the format of a toy theatre. I was very inspired by the paper theatre Elena created for the illustrations of Mary Shelley’s Frankenstein published by Nordica Libros. 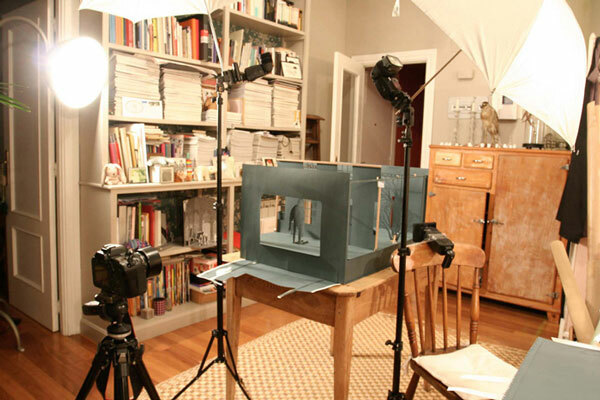 Elena Odriozola’s toy theatre being photographed for the book. While working the book, La escuela de papel · L’école de papier began to take form. L’école de papier, is a nomadic, ephemeral school that provides a space for playing with paper, scissors and our hands. 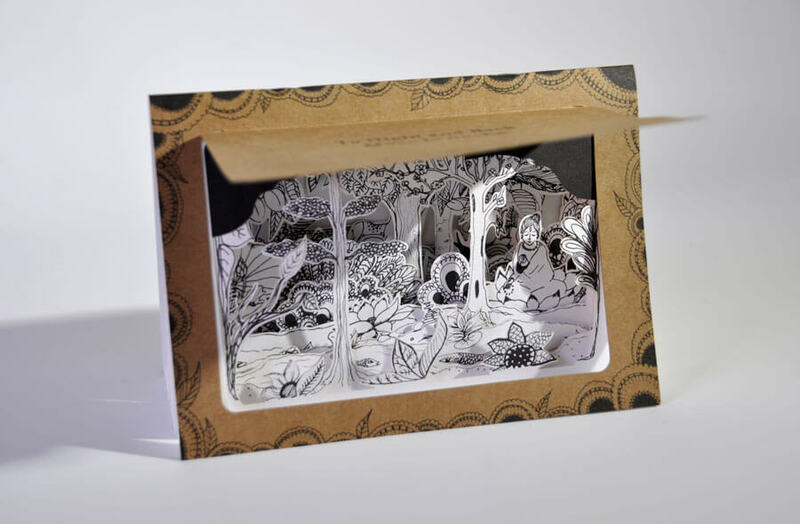 Both projects share the same fascination for cutting paper and experimenting with it. 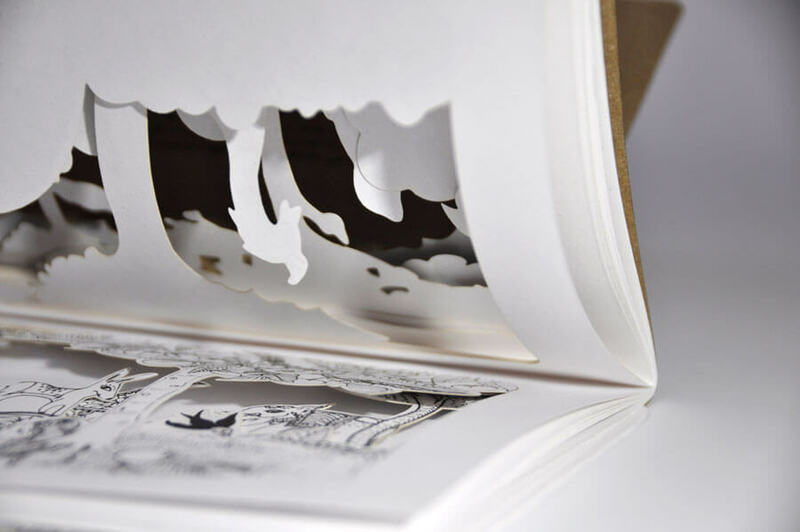 In the book format, the superimposed cut pages permit a game of depth and surprise. In the school, different types of paper toys and traditional paper techniques are explored to propose creative workshops for children and adults. 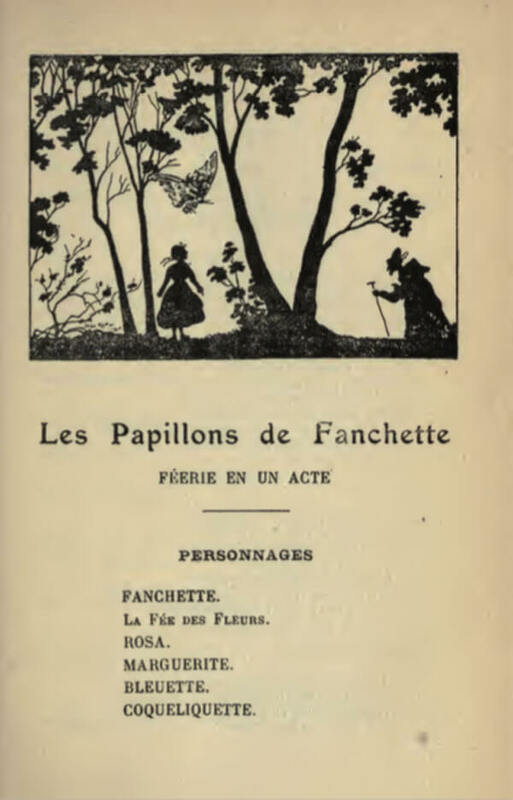 Some of the school’s workshops given at the French Institute in Madrid include: Playing with Light: The Tales of Charles Perrault at the shadow theatre, The Autumn Leaves: Learning to cut paper leaves (inspired by Emilie Vast and Katsumi Komagata), Paper Garlands (inspired by Nathalie Parain’s Ribambelles). 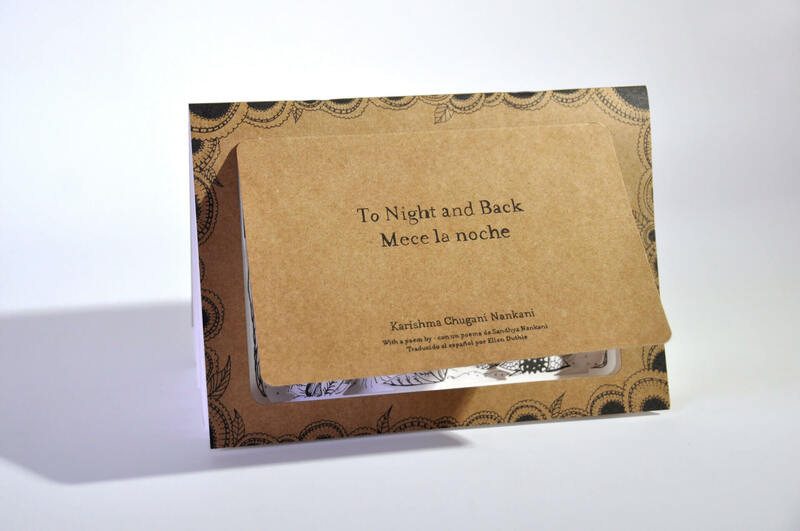 Through the process of working out the details of how to publish the book, it made perfect sense to marry these two projects, making To Night and Back · Mece la noche La Escuela de Papel’s first editorial venture! The book can be currently bought directly by writing to me, and will shortly be available on the L’École de Papier website, which I am thrilled to announce is under construction as we speak by the very talented Ana and Laura from La Particular.